Update: here's a nice video (in German) showing the bidirectional OLED in action. 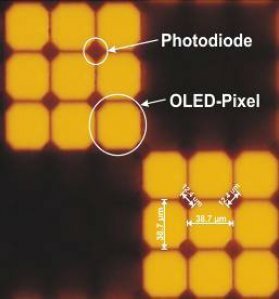 The Fraunhofer Institute announced their bidirectional OLED on CMOS microdisplay back in 2009. 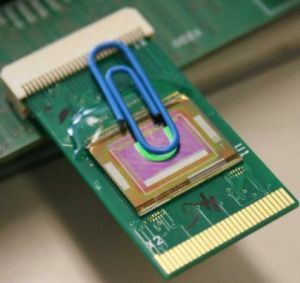 The idea is to have an OLED display and a camera on the same chip by integrating photodiodes between the OLED pixels. On March 22rd (at the Smart Systems Integration 2011 exhibition in Dresden, Germany) they will demo the system for the first time. Fraunhofer's demo chip includes a monochrome AMOLED display (320x240) and a 160x120 monochrome camera. The brightness is 15,000 cd/m² and the chip size is 0.6" diagonal. They are also working on higher resolution displays (VGA and above) and small chip sizes (0.5"). 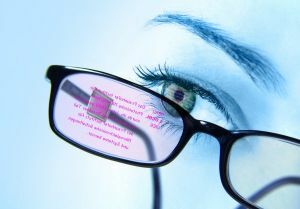 One of the possible applications for such a bi-directional display is interactive data glasses.